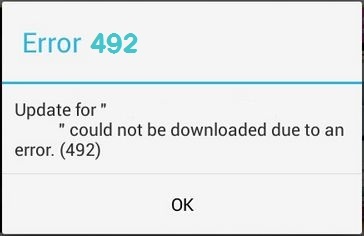 The error 492 is experienced while trying to update or install an android application. This error could be frustrating especially if you do not know how to fix it or if you have no clue what might be preventing the app from installing. I am going to explain what the error code 492 means, why it’s happening and what you should do to fix it. SD card or Phone storage). Even though insufficient storage space is the most common culprit, there are a couple other reasons why the error 492 may occur. SD card either has a corrupt file or is infected. An elf has sabotaged the app update process. Something wrong with Play store. I don’t know why but restarting your phone may clear the error 492 for a while, but it may or may not come back later. Try restarting your phone to see if it works. If it does and the error pops back a few days later, you may want to look at the other options below. To clear the cache of your Google play store app. Go to Settings > Apps > Google Play store. Now click the button that syas “Clear Cache”, if the error persists after that, try “Clear Data” button. This fix only applies to you if you are trying to update an app. Uninstall the app completely, then reinstall it. If the error 492 prevents you from reinstalling, you would have to download the app manually (as an apk file) from the internet. Your memory card may contain corrupt file (most likely in the storage folder of the app you are trying to update). First, scan your SD card for viruses (you may want to use a computer for this). Now you would want to copy over all the files that are precious to you to another folder on the computer. Format the SD card. (This would delete everything in it and make seem like a brand new SD card). Copy your precious files back into your memory card.